Intergranular cracking and void nucleation occur over extended periods of time in alloy 617 when subjected to stress at high temperatures. Damage occurs inhomogeneously with some boundaries suffering failure, while others are seemingly immune to creep. Crack propagation associated with grain size, and grain boundary character was investigated to determine which types of grain boundaries are susceptible to damage and which are more resistant. Electron backscatter diffraction and a stereological approach to obtain the five-parameter grain boundary distribution were used to measure the proportions of each type of boundary in the initial and damaged structures. The samples were crept at 1273.15 K (1000 °C) at 25 MPa until fracture. It was found that in addition to low-angle and coherent twin boundaries, other low index boundary plane grain boundaries with twist character are relatively resistant to creep. Manuscript submitted February 14, 2013. 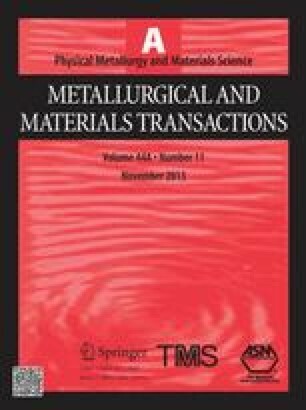 The authors gratefully acknowledge the receipt of the alloy 617 metal from Dr. Richard Wright of Idaho National Laboratory. Mr. John Bryson is also thanked for his work in designing and building the test jigs required to test at temperatures in excess of 1273.15 K (1000 °C).